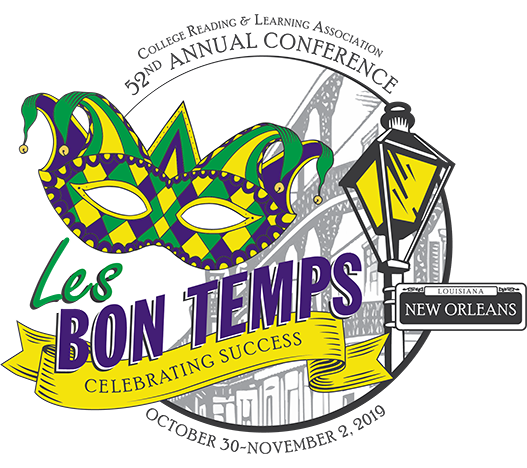 As you’ve heard, we’re meeting in New Orleans for CRLA’s 52nd Annual Conference. We believe it is going to be a great conference! The weather should be wonderful. The hotel is lovely. We’re going to be in New Orleans over Halloween, and that town knows how to party. But even more importantly, CRLA knows how to bring together your great ideas, research, and programs, and we will be sharing all of your successes through informative and educational conference sessions. Dr. Ron Kelley serves as the CEO of the National Training and Education Group. Since 2006, his company has been one of the nation’s premier corporate training and education industry training companies. He has worked in the music industry and in secondary education. He has a wealth of experience working with underserved at-risk students. He’s the author of several books and will have them available for purchase after his keynote on Oct. 31, 2019. Dr. Kelley’s speeches celebrate our students’ humanity as well as ours. He will make us both laugh and cry, but, most importantly, he will help us recharge for the work that awaits us when we return home. Dr. Tamara Clunis is the Vice President of Academic Affairs at Amarillo College in Amarillo, Texas. Formerly, she taught reading and learning strategies at Austin Community College. She went on to become the Curriculum Director for the U.S. Military Academy Preparatory School. After that she became the Director for Developmental and Adult Education at the Texas Higher Education Coordinating Board before moving on to Amarillo College. She was also selected to be one of the ten recipients of the Outstanding First-Year Advocate Award in 2013 from the National Resource Center for the First-Year Experience. She believes in student success and those of us who work to help students be successful! We are delighted to host these motivational and inspirational speakers at our 52st Annual Conference in October!